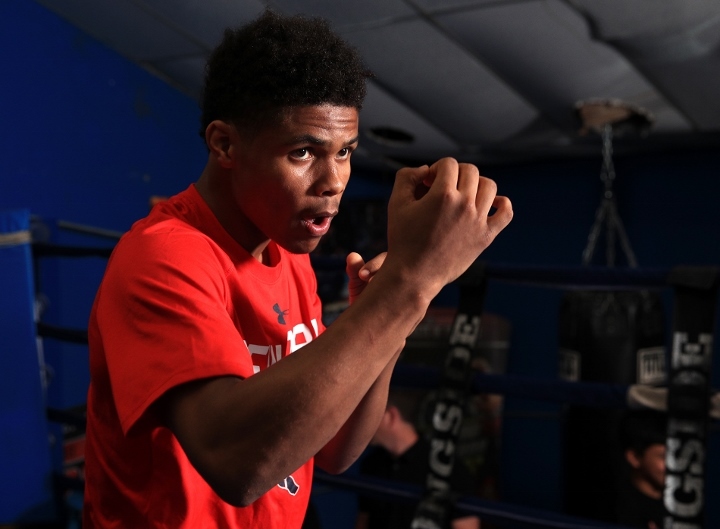 Lincoln, Nebraska is a long way from Rio de Janeiro, Brazil, but Shakur Stevenson doesn’t mind. A year ago, he was chasing a gold medal in the 2016 Olympics. Today, he’s chasing gold of a different sort in the pro boxing ring. In that time, everything didn’t change, but almost everything could be an apt description. The 20-year-old from Newark, New Jersey signed a deal with Top Rank, won his first two fights, and now he’s in Nebraska getting ready for bout number three on Saturday against David Michel Paz. He’s a pro now, the hype of his first two fights has died down, and he’s settling into a career many believe will result in at least one world championship. What has also changed from the amateurs is his training, though he likes to maintain a team setting in the gym. For evidence of that, just ask Stevenson about his Team USA squad mate Claressa Shields, the two-time Olympic gold medalist who won her first world title as a pro with a fifth-round stoppage of Nikki Adler earlier this month. It’s the kind of win by a friend that can give a young prizefighter that itch to get his own championship hardware. But could Stevenson with just two pro fights, do what Shields did in four? Is talent and an extensive amateur career enough? It’s an honest assessment from a young man who will have plenty of time to get where he’s going. And he’s in no rush. In fact, he’s been enjoying the ride. It has been some year. So what do the next few look like?